This time of year we all get so excited to start eating locally grown strawberries, not sure what it is but we all say the same thing..nothing tastes as good a locally grown strawberry! Good news is our local strawberries have started to ripen and you can visit our market to purchase ready picked strawberries 🙂 and let me tell you they taste amazing! 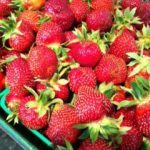 With regards to Pick Your Own we need the sun to do its magic and ripen up more of the strawberries on the plants… our best guess at this time is that we will open our fields around June 20th – June 25th. ← 2018 Opening Day – May 10! !